While we all have grown to love manufactured scents like Clinique’s “Happy” or Chanel “No. 5”, who can deny that the scents that we crave the most are of the earth? After an afternoon’s work in the garden, when I am blanketed from head to toe in a thick, damp layer of my surroundings, I am reluctant to wash the potting soil from my arms. Something about the delicate, moist mixture of manure and dirt soothes my mind and enriches my senses. Every time I sense the coming of rain I step outside and breathe in slowly, deeply, filling my lungs and spirit with the sky’s perfume. For years I have longed for the commercial bottling of such scents. We all like our perfumes; when I mist my wrist I can confidently grace public knowing that I smell good, but I never take in those scents like I do the rain. If I smelled that good, I’d never get anything done. I would remain in my bathroom permanently, nose to wrist, eyes closed, in a permanent state of ecstasy. We may never find these godly scents in a bottle, but you can find them in a cup. Ancient and mysterious, Puer tea embodies some of the most pleasurable scents known to man: Soil. Earth. Clay. Must. The flavor mimics its robust scent- smooth, earthy, and non-offensive. Manish Shah, owner of Maya Tea Company, once described Puer’s unique flavor profile as follows: “It’s like a thick stack of National Geographics stored away in an attic for ten years…”. This description was given to a potential client, and my jaw hung open as I sat next to him sputtering desperately that Puer “is not that bad” and assuring the customer of its worthiness. While perhaps not the most flattering of descriptions, Manish pegged one of the most important aspects of Puer – age. Puer is indeed stacked and set aside for years, often inside a clay pot contributing to its natural aroma. The tea leaves are stored while slightly damp, allowing for a natural fermentation process that continues slowly as the tea ages. For that reason, Puer is the only variety of tea that gains value as it gains years – while other teas grow stale with time and are arid after only a few short years, most Puer is not consumed until it reaches its tenth year and as it gains considerable years its value grows exponentially. Often, pressed Puer cakes that have been preserved for over a century fetch a retail price of over $13,000. As you might imagine, there are hoards of consumers that make their Puer selections by vintage, snubbing low-cost varieties for those that are most valuable. Differences in flavor are distinctive between varieties, and I encourage people to choose their tea with a blind eye for the price tag. On several occasions I have prepared high grade Puers and have found myself disappointed with the resulting infusion; I much prefer the fuller flavor of the loose variety, which also proves a better friend to my wallet. Why Puer? Taste, first and foremost. Value, for those of you who are a collective type. Lastly and always most importantly, for good health. All teas have been proven to lower cholesterol, blood sugar, blood pressure and the risk of cancer while boosting metabolism and bone density. 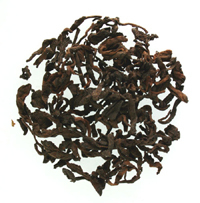 As a variety of tea, Puer offers all of the aforementioned characteristics, yet due to its unique processing it carries a few extra tricks up its sleeve. Studies within China, France and Japan have shown Puer to aid in the detoxification of the liver, prevent intestinal infection, and aid in digestion. Often the crew of Maya Tea frequents local food establishments during lunch together, and when we return after an hour of gorging, shuffling through the front door with limbs dragging behind and settling down heavily into our seats, we turn to Puer as our savior. The fermented leaves help our overstuffed bellies to process quickly and effectively, the caffeine allowing our sluggish minds to settle into work. As a whole, our company relies heavily on Puer as the cure for the self-inflicted “food coma”, as a gateway to our alert and active minds, and as a soothing and soulful way to connect to the earth around us. Puer has never disappointed us. So the next time the scent of precipitation is carried in the breeze or you retire from hours spent in glorious mud, have indulged too much during mealtime or are sitting down with a National Geographic, settle in with a cup of Puer. You will be pleasantly surprised.